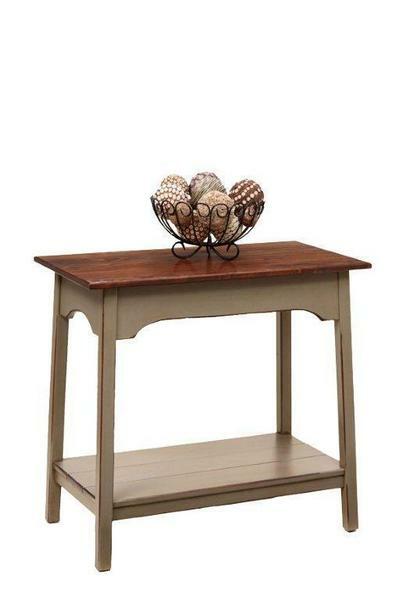 The Amish Pine Wood Farmhouse Large End Table is full of country charm. Made of solid pine wood, this end table is available in a variety of finish options. You can go with a standard finish or choose light to heavy distressing to create an antique look. The Farmhouse Large End Table is built by hand with solid pine wood. Pine wood furniture is softer than other woods, but offers durability and strength to perform for years. Pine furniture offers quality wood furniture at a great price. Pine has a fine grain that shows off a painted finish nicely, or it takes to distressing beautifully, offering an antique look. Our solid wood end tables add balance to living rooms and family rooms while offering surface space to display items or keep popular items near the couch or loveseat. This large end table measures 32" wide, 17" deep and 30" high. It is made in an Amish wood shop in Pennsylvania. Please email or call us today with any questions about any of our end tables. Thank you for shopping with us.